Warner, Jim. 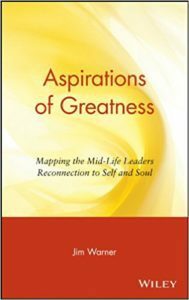 Aspirations of Greatness: Mapping the Midlife Leader’s Reconnection to Self and Soul. New York, NY: John Wiley & Sons, 2002. Based on Warner’s retreat work with over 500 executives, the book provides an easy-to-read description of the four-quarter model. It also maps the soul-work pilgrim’s journey from disillusionment to self-discovery to destiny.